Enter Inspector Devenand Hunter from the Yard, an Anglo-Indian who is not going to let some barmy society beauty witnessed talking to herself derail his investigation. Something very peculiar is afoot at Compton Court and he's going to get to the bottom of it - or go as mad as its mistress trying. This book is so much fun, which seems a weirdly odd thing to say about a murder mystery. Nevertheless, it's true. For her first foray into English cozy mysteries, Maggie Robinson has hit it out of the park - or whatever the English equivalent would be - with this expertly crafted whodunit. From beginning to end, it's an absolute delight. With impeccable timing, and wit, Robinson guides somewhat naive Addie as she explores her newly acquired independence, so rudely interrupted by her dead husband's ghostly presence, as dead bodies keep turning up during her house party. The story flows beautifully with perfectly placed twists and turns to keep the reader guessing as to the identity of the killer or killers. There are several plausible suspects and Robinson drops clue crumbs here and there, keeping me - and everyone at her house party - wondering. All of the characters, primary and secondary, are well developed and contribute to the progression of the story in some way. Dev, the Scotland Yard Inspector, in particular, is one I hope we'll be seeing more of in future books. He and Addie have chemistry stirring between them that I'd love to see explored. Rupert, less than exemplary in life, shows great promise in death. The scenes between him and Addie are rife with humor and also a bit poignant. I don't know if he'll continue to be present in future books but I hope so. If you're in the mood for a roaring-twenties cozy mystery set in the bucolic English countryside with sparkling wit and banter, a well-crafted mystery, a likable protagonist, a charming, but meddlesome, ghost, a handsome inspector, and a house filled with potential murderers (could it be the school chum in the library with a candlestick? ), then Maggie Robinson's Nobody's Sweetheart Now is just the book for you. It has my enthusiastic recommendation. Welcome back, Maggie! 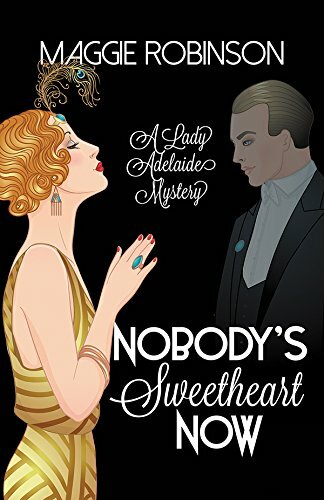 I’m so excited to celebrate the release of Nobody’s Sweetheart Now, the first book in your English cozy mystery series. What a fun story! Please tell our readers what they can expect from this new series. Well, I’m trying to conquer a new decade and a new genre, the 1920s classic mystery…with a touch of the paranormal. The book comes out next week, on November 13. I’ve written historical romances set in the Regency, Victorian and Edwardian eras, but I challenged myself to try something a little different. I’ve had more fun than should be legal. My heroine, Lady Adelaide Compton, is a widowed marquess’ daughter. She thought she was rid of her unfaithful husband Rupert, but finds out to her shock he hasn’t quite left this astral plane. He has to make up for his many sins before he can go in a heavenly direction, and discovers his talent for detection. A real detective inspector from Scotland Yard, Devenand Hunter, has no idea he’s being assisted by a ghost! The second, Who’s Sorry Now?, comes out next May, and I’m halfway done with the third, tentatively titled Make Believe. The book titles come from popular songs—it was a fabulous decade for timeless music, and there are a lot of songs! I’d like to write them to infinity…but all those bodies building up might give me pause, LOL. I never realized how enjoyable it is to kill characters rather than make them kiss. Nobody’s Sweetheart Now is set in 1924 England, a time and place that I find fascinating. What is it about this era that inspired you to set your series there? When I was in high school, I dressed as a flapper for a youth fellowship musical, and Charlestoned the night away—the seed was planted! The twenties were years of wild extremes, which provide lots of plot bunnies. I chose England, specifically the Cotswolds and London, since I’ve been a frequent visitor. I’m trying to follow in the footsteps of those Golden Age of Mystery authors, who were my first reading loves. The aftermath of the Great War was particularly poignant; a whole generation of young men never returned. My antihero Rupert was a flying ace who became bored by peace time, and is even more bored by death! I love the vintage autos and fashion described in this book. Please tell us about the car you’d be driving and clothes you’d be wearing if you could time-travel to the 1924 English countryside for a day. With money being no object, of course. I just so happen to have a Pinterest board which brings me great pleasure and inspiration. Here’s the link: https://www.pinterest.com/maginme/lady-adelaide-series/ so you all can drool too! If my arms were not so flabby, I’d be wearing a sleeveless, sequined flower-embroidered teal silk crepe dress with as many diamonds and aquamarines as I could slap on. I would be chauffeured in a Bentley Landaulet, of course. Will Addie be helping to solve cases on both sides of the pond? In the second book, she’s just returned from America, where no one she knew was knocked off during her visit. I think I’ll keep killing off British people so Dev and Scotland Yard can get involved. What was your favorite scene to write in this book? “What are you doing snooping around?” Addie hissed into the bushes. “Not snooping. Until fairly recently, I was the lord of this manor. Let’s just say I was surveying the property. And checking up on your welfare, too. You were unchaperoned. I don’t trust that foreign fellow.” Rupert stepped out from behind the hedge and brushed his suit off. For something that he’d worn now for six months under unusual conditions, it was holding up well. Rupert always had an answer to everything. Addie wanted to slap him, but reminded herself he wasn’t really there. Or was he? Could it be possible that she was really, truly being haunted by the ghost of her husband? Hot tea. With too much sugar and a slice of lemon. Yoga pants, though I don’t do yoga! Christmas decorations before or after Thanksgiving? While the kids and grandkids are home, we drag the tree and decorations up on Thanksgiving Day evening, then spend Friday puttering around. The tree is pre-lit, so there are no tangled strings of lights or cursing involved. The grandkids hang all their favorites in a bunch on basically one branch, and then when they’re gone, I redistribute them more evenly. I am a bad grandmother. Rupert seems pretty real to me now, LOL. I can’t rule them out. Thanks, Maggie! Do you have anything you'd like to ask my readers today? I’m going to turn your last question around—has anybody had a ghostly encounter or odd feeling in an old house or a woo-woo Ouija board experience? I’ll give away a signed hardcover book of Nobody’s Sweetheart Now to a random commenter even if you say no! Ghostly encounters have occurred since we moved onto our 1898 Victorian farmhouse. Our first night there, I awoke in the wee hours of the morning with the distinct feeling someone was standing in the room looking at us. It was a feeling that "Oh, you are the new residents. You will do." Our son (sixth grade at the time) woke up one night with a 10 year old or so girl standing next to the bed. A ghost. After we had been in the house a year or so, one of the moms in our son's scout troop asked me if we had seen the lady in white yet. Her family had rented the house when she was a teen. The house's history has a lady in white appearing on the upstairs landing usually the night before someone dies. Needless to say, we do not that one to materialize. One of the kids did say they saw her. No people died, but our cat did die (of old age, it was 17) the next day. The one experience that shook our daughter up is the only negative experience we have had in 26 years. We were traveling and our daughter was house/pet sitting for us. She was sleeping on the sofa in the family room, a new addition to the house. She said she didn't feel comfortable in the old part of the house. She got up about 1 am to take care of her infant son who was in a port-a-crib. While changing his diaper, she had a menacing feeling that something evil was watching her. When she looked at the hallway leading to the old part of the house, there was a greenish cloud taking the shape of a man. Her imagination? Or black lab had been asleep under the crib. At the same time our daughter saw the person forming, the dog got up growling and every hair in its back was up. The dog headed for the figure growling, but before she got there it vanished. When it vanished, the dog stopped growling and came back to her spot under the crib. It has been 20 years, and our daughter still won't stay at our house. Things have been quiet since then, thankfully. Whoa. Thank goodness for good boys! Our dog will bark at anything though, so maybe there wasn't anything spooky, LOL.Here's hoping things stay quiet! I sometimes get a feeling, almost like vertigo, as I walk down our long corridor at night. It's unsettling. I've been in places where you can feel the past pretty strongly too. Hold onto those walls! Nobody's Sweetheart sounds like a great read Maggie. Love humor in all genres. The house we live in was built in 1900 and there have been some unexplained happenings going on. While sitting & reading I'll hear what I think is my older daughter walking down a short hallway by our kitchen, I'll call out to my daughter and no answer so I get up and she's not there, no one is. Or you know that feeling when you feel someone behind you and no one's there. Anyway, there are no bad feelings so we both just say okay we can all be here. Old houses have a life of their own, I thinks. Lots of creaks and noise. No ghosts, I hope! I love ghost stories but (thankfully) have not yet encountered one. I enjoyed reading Patricia B. 's story about her own home. Wow, Patricia! You are brave. I'm not sure I could live in a house with ghosts. I'm going to add Maggie Robinson's book, NOBODY'S SWEETHEART NOW to my wish list. When I was young and we lived in an old house in an older and mature neighborhood, there was a house which the neighbors mentioned should be avoided since it was inhabited by ghosts. I used to walk by this house on my way to school. I was not worried but then it was during the daytime and nothing appeared different about it. I listened to the stories and never did experience anything unusual. This sounds like the Jumanji movie! Good morning PJ & everybody! I'm off to an appointment, but I'll be back to check on things that go bump in the night...or day...and tell you of my own ghostly encounter, which may or may not have been a dream, LOL. PJ, thanks so much for the fantastic review! I'm so glad you like the book. It was such a joy to write...I must be more bloodthirsty than I thought. Thank you so much, PJ! Coming from you, that's everything! Your novel sounds captivating and intriguing. I love the era and the story greatly. As far as ghostly encounters are concerned I did experience something strange when we were away on a holiday in the winter many years ago. We stayed at an old lodge which had many interesting features as well as creaks, noises and ghostly feelings. When I was awoken during the night there was a blizzard raging outside but inside I did hear talking and whispers. I wasn't worried though and fell asleep. Morning arrived and all was well. That must have been me telling the snow to go away, LOL. I live in Maine and I get too much of it. No ghosts. I came home from elementary school one day to find no one home. My father had apparently been trying to fix the bathroom sink and left wrenches and such out by the sink. Most people would think their parent went to the store to get a part they needed. I turned to my sister and said "Uncle Nat" died. Imagine my surprise when our parents called us from my aunt's to say just that! My Uncle had not been sick. He laid down on a couch in his office after lunch because he didn't feel well and never woke up. That was really creepy that I knew that he was dead before anyone told me. Now, if only you could predict lottery numbers! You must have been pretty freaked out as a little girl. Yes, I like Murder/mystery books. I've read Jennifer Ashley's Death Below Stairs and Scandal Above Stairs which were really good. I can also recommend Catherine Lloyd's (aka Kate Pearce) "Death" series. Anyway, when I still lived in England, we lived in a very old country cottage in Harthall Lane, Kings Langley, Herts. My husband was stationed in Greece on a mountaintop, so myself and the kids were not allowed to accompany him. Several strange things happened when I was living in the cottage. My brother-in-law always used to play with my kids and one time he came downstairs looking chalk white and shaking a bit. We asked him what was wrong and he said that when he was climbing the stairs, he heard footsteps following him. They followed him into the kids' room and then the hairs on the back of his head stood out. He could hear breathing but nobody was there. The kicker is, I'd asked my friend to watch my kids' whilst I went for a parent/teacher meeting at the school. She looked a bit funny when I got home and couldn't wait to leave. A few years later my husband and I went to see some other friends that we knew and my friend said to me "right, now that you're no longer living in the cottage, I'm going to tell you what happened the night you went to the parent/teacher meeting". She then proceeded to tell me that my friend Anne (the one babysitting) was in the living room with the kids and the door handle kept rattling. She thought it was me trying having difficulties opening the door. so she got up to help. When she managed to open the door she almost fainted when she saw a lady in a blue crinoline dress just floating up the stairs. That was just one of the many strange things that happened during our time living there. I'm glad that I never found out about this until after I moved out. Several unnerving things had happened to my small son like when I was in the bedroom making the bed and all of a sudden a heavy oak wardrobe fell on top of him. Thank God that as it fell forward the door flew open and he was cushioned inside. Another time a solid wood door came off of it's hinges and fell on him injuring him. Another time the stair banister rail came off as he was going up the stairs. So many things happened to my 4-year-old. Obviously, the ghost didn't like boys, as nothing untoward ever happened to my daughter. To get to my kitchen and bathroom, I had to walk through the dining room which was across the hallway from the Living Room. The dining room had two massive radiators, but the room was always ice cold. Sorry to have rattled on. Whoa! Sounds like you had a whole community of ghosts living with you. Sure am glad your little boy was okay. Oh my! I'm so glad you're not living there anymore! I lived in a 1908 Victorian in Milwaukee just out of college. My roommates never encountered anything paranormal, but I was awoken several times in those 2 years by a shadowy image of a man standing at the end of my bed; it was creepy. One time I woke up to a farmer, complete with overalls and a hat, standing there with a cow. This one was more comical, because really, a cow?! But otherwise it definitely frightened me! Definitely creepy, Katie. All these stories are making me glad I don't live in old houses! A cow? LOL. But no laughter at the man by the bed. Yikes. I'd be screaming for sure. I haven't spotted a ghost, but I've smelled perfume that shouldn't have been in the room. And scents can be so triggering to memories. I wonder what that perfume was trying to tell you! I think things like that can often be more unsettling than actually seeing something. Oh, this sounds like such a charming mystery! And in answer to the question, no, I have not had a ghostly encounter, odd feeling from an old house and I have never used a Ouija board. However, I am open to the possibility of ghosts. There seem to be stories of them from every society. I'm home and about to open my manuscript, but here's my story. Actually, a couple of them. In college, I was fooling around with a Ouija board, and asked it who I loved. At the time I was dating a Vic AND a Bill (William). That whatever-it's-called (I was not holding it, and the girls did not know) wavered between V and W forever, LOL Just like me, it couldn't make up its mind. And after I had my fourth baby, Abigail, I really, really thought I saw my great-aunt Helen at the end of the bed as I was nursing her. Granted, I might have been asleep or just plain crazy after having four kids, LOL. But Abby's middle name is Miller, named for my grandmother and her sisters' maiden name, and I just had the feeling Helen was coming to check up on the family namesake. I never heard that before. I saw a quarter on the ground last week...must be lots of folks saying hi! No ghosts but dejavu. We were going to friends house for Christmas eve. I kept thinking that my friend's brother should be here. I kept asking her where is he. Something is wrong. She called me the next morning. The police found him. He was killed on the way to her house. Whoever it was stole all the presents he had for his kids. Oh my gosh, that's awful! And such a dreadful memory for what's supposed to be a hopeful, happy holiday. My heart goes out to all of you! My family had to use temporary housing in Dayton Ohio while we waited to get into military housing. It was an old house that was normally used as male student housing. Up stairs, in one large room that was obviously used as a dorm, when you walked through the door, it was cold and clammy. If we would have been there in winter, OK, but this was a hot July summer. The room also felt oppressive as though there was sorrow and anger all around you the minute you walked into the room. Mr Wonderful had to have overnight duty at times. On nights when he was gone, I sat up all night to keep my children safe. And by the way, this book, Nobody's Sweetheart Now is a wonderful book. Ms Robinson is a new to me author, and I intend to become one of her greatest fans. Oh, thank you so much, Annette! And how weird about the house--unwanted air-conditioning, LOL. I wonder if we leave imprints of emotions behind. My writing chapter had a psychic as a guest speaker (just in time for my book!) and he seemed to think yes. Mystery ahoy! I don't think I'd have been doing much sleeping there either! I can't say I've had any "ghostly" experiences, but my young-adult daughter is a die-hard when it comes to wanting to visit places that are reputedly "haunted". While on any vacation together, we always have to visit any place that has such a reputation. It's made for some interesting stories and laughs. I am way too wussy to ever go on one of those ghost tours. Can't watch scary movies either. I've been on ghost tours in both Savannah, GA and Charleston, SC. Let me tell you, they'll make believers out of the most skeptical among us. Especially Savannah. I've never seen a ghost but I've definitely had otherworldly experiences that have convinced me there's more out there than we can perhaps understand. I've posted before about the rosebush my late husband gave me that stopped blooming (I thought it was dead) only to produce one perfect rose on the morning of his celebration of life two months after his death. Signs...I kind of believe in them. What a gift. Wow PJ! He was sending you a sign. Hi, Maggie! Banana, who just turned 17 today, just came off her HS production of Agatha Christi's Ten little Indians re-named And Then There Were None, so I am in a very cozy mystery mood. I've had a couple of paranormal things happen but my cousin had one involving a canine psychic. You heard right - a canine psychic. I've always wondered what my dog was thinking, LOL. Yay for Agatha Christie! Have you seen the new version with Aidan Turner? Yum. I've had some unusual experiences that make me believe in ghosts and otherworlfly things. The night my mom died while I was laying in her bed, there was movement on the other side, next to me, on her king-sized bed. I just figured it was her or my dad checking on me, not trying to freak me out. Yeah. I believe a lot of stuff is going on beyond our reality sometimes. I'm never going to say there aren't things beyond 'rational' explanation even though I've never had a true ghostly experience. I have had unusual experiences though that go beyond the normal 6th sense type. I have at times experienced my daughters daughter's emotions even though I haven't been near her. Once she was in the ER having an CT scan for blood clots. I was heading to the hospital- a 2 hour drive from home. I was getting close, not really worried when I was hit by a wave of panic and the desire to cry. Within 2 minutes my daughter called crying to let me know they had found a few clots. A several times after this when she was flying I knew exactly when she boarded the plan and when it was about to take off because I have been hit with massive nausea and panic - the same reaction she has to flying. I had convinced myself it was sympathy feelings since I knew she was flying until she changed to an earler flight to surprise us one time. Same symptoms a day before they should have happened if I was giving myself them worrying over her.